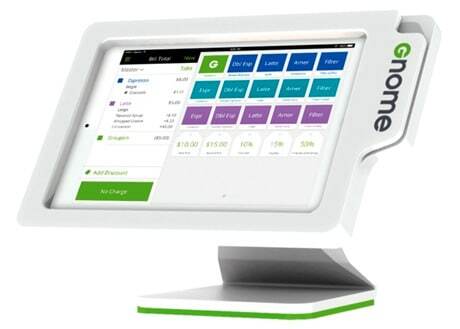 The new Gnome POS terminals will cost merchants US$10 a month to lease and come with a payment processing service that costs 1.8% plus 15 cents per transaction for MasterCard, Visa and Discover purchases. “A consumer with the Groupon app on their iPhone walks into a merchant to redeem a Groupon offer,” Groupon told NFC World+. “The phone, assuming its Bluetooth is enabled, communicates with Gnome. The software matches the offer with the merchant and the consumer’s account, eliminating the need for the printed offer or to hand over the phone. “We facilitate the connection for vouchers through secure communications with our servers. The merchant will see pop-ups on the checkout screens with the names of all customers with a voucher and with Bluetooth turned on that are currently in the merchant’s store. All they need is the Gnome tablet we provide — it has built-in beacon capabilities. A suite of customer relationship management tools “including the ability to customize marketing campaigns based on purchase history, share customer feedback via social media and respond to customer inquiries or comments” is to be added to Gnome soon, Groupon says. Integration with accounting software programs such as QuickBooks and Xero is also to be included. “When it’s complete, Gnome will serve as an operating system for merchants to run their entire operation and enable them to create real-time promotions that bring customers into their business when they need them the most,” says Eric Lefkofsky, Groupon’s CEO. So does this mean my iPhone does not need to Bluetooth sync with Gnome or even be discoverable?